We’re excited to let you know that starting from April 2019, you can save up to USD 40/pax with our hot promotion for tour program 4 days 3 nights: Hanoi – Halong (overnight on cruise) – Ninh Binh. If you have a very short stop in the North Vietnam, visit its most attractive nature world heritage – Halong Bay, then stroll around to enjoy the rural landscape and ancient relics of Ninh Binh and indispensable Hanoi, the capital of thousands years history. – Exploring the ancient citadel of Hoa Lu and taking an exhilarating boat ride through the beautiful limestone cliffs in Tam Coc. Upon your arrival at Noi Bai airport, our tour Driver will be waiting for you at the entrance of security area hanging a board with your name on. Get on your private car to center of Hanoi. Arrive at your hotel and relax. Please note that checking in time is 2.00pm. Afternoon, we start the tour with a visit to the Temple of Literature, the first University of Vietnam. Enjoy a cyclo tour around Hanoi Old Quarter which is considered the central and the soul of the city. End the tour with a show of Water Puppetry, a unique stage art created by the Vietnamese peasants. Your shuttle bus drive you back to Hanoi. At about 17.00PM, arrive in Hanoi, check in your hotel. 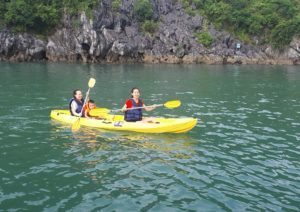 After lunch, you also take a paddle boat ride through the beautiful karts limestone fringed waterways of Tam Coc, means 3 caves. On the boat you will venture through lime-stone mountain… This trip allows for some amazing photographic opportunities in a unique region of Vietnam a world away from Vietnam’s frantic cities. Drive back to Hanoi at about 18.45pm. Tour prices shown are ‘per person’, based on a traveling party of at least 2 adults, and sharing a room. If you intend to travel alone, the cost might be higher. The ‘Single supplement’ applies for single travelers and needs to be added to the tour price. 3 nights at centrally located & well selected Comfort hotels (3 star-hotel).